Canada’s nuclear industry faces a “critical decade” in which it will have to prove that big projects can be brought in on time and on budget, says the chief executive of Ontario Power Generation. Tom Mitchell said many of Ontario’s nuclear reactors are reaching the stage when they need mid-life refurbishment – a complex and expensive process. That’s certainly the case at OPG’s big Darlington nuclear station, which supplies about 20 per cent of Ontario’s power, and where a multi-year overhaul of all four reactors is due to start in 2016. OPG also hopes to build two new reactors at its Darlington station – a project that’s likely to be confirmed or quashed when the government releases the review of its long-term energy plan in the next month. It's a tough day for Ontario's nuclear industry, but tough days are nothing new and today's news need not end up being meaningful. 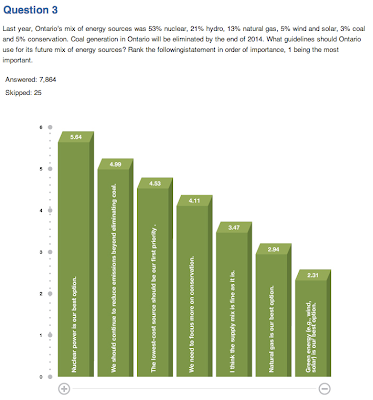 When the Ontario government first directed the Ontario Power Authority to produce a long-term energy plan, the direction was for up to 14,000MW of nuclear capacity. No plan was accepted for implementation. When the Ontario government next directed the Ontario Power Authority to produce a long-term energy plan, the direction was for up to 12,000MW of nuclear capacity. No plan was revealed (or accepted for implementation). That the same government now appears to be stepping down the plan to 10,000MW (assuming 6000MW of refurbished units at Bruce and another ~4000 at Darlington) isn't surprising - but it's also coming from a government and, after over half a decade of incompetent management, a bureaucracy, that is demonstrably inept in forecasting, including costing. The government could have fallen this week, but the New Democratic Party's Andrea Horwath refuses to bring down the government. Horwath lacks substance but the NDP's energy critic, Peter Tabuns, does not. Tabuns was formerly the Executive Director of Greenpeace in Canada and, unlike more prominent former Greenpeace executives, remains staunchly anti-nuclear. The squelching of new builds is likely the price of 6 more months of wasteful government by the Liberal party as Horwath avoids attempting to win the position of Premier. The eventual fate of new builds will likely come after an election many expect next spring - although Horwath may be content to extract empty promises from Wynne right up until the next scheduled election date in 721 more sleeps. Scott, you called it right. This is pure and simple mollification of the only other party that can hurt the Libs in the 416.